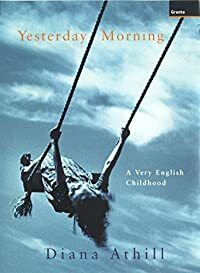 Yesterday Morning by Diana Athill was published in 2002 and it’s subtitled A Very English Childhood which no doubt is what she had but she was also part of a very privileged and well off family. She was loved and cherished, it was all ponies and servants and living in a huge house on the Norfolk estate which belonged to her grandfather. All of the cousins saw it as their home as the aunts were all married to men in the armed forces who were mainly out of the country most of the time, so the women all seemed to have gone ‘home’, well it’s one way of getting out of having to grapple with your own housekeeping and servants I suppose! But the book begins with Diana Athill’s mother hardly being able to believe that she now has a 70 year old daughter. The mother was 92. “She was well aware of being a very old woman, but she still felt like the Kitty Athill she had always been, so it was absurd to have another old woman as a daughter.” Her mother lived until the age of 96, but Diana is still going strong, she had her 100 birthday in December. This is another enjoyable read from Diana Athill, but it’s so sad that her entire adult life seems to have been blighted by her being emotionally damaged by being dumped by her fiance who immediately married someone else, she had loved him since she was 15. He was in the RAF during WW2 and was killed a week after that. Apparently she was afraid of being hurt again so never became very deeply involved with anyone again. There are quite a lot of short You Tube videos of Diana Athill talking about her life and writing. She must be just about the last person alive with that sort of accent, a sort of 1930s BBC announcer voice.